Make your money go further with TOTUM, powered by NUS Extra. TOTUM is the NUS extra card evolved. It comes with all the same great discounts and offers as the NUS extra we know and love but with additional features and functionality loaded into a mobile app. Is my NUS extra card still valid? Yes! Your NUS extra card will remain valid for the whole of its life (ie. until its expiry date). You do not need to swap or upgrade your card to a TOTUM branded card. Your card will still be accepted in all participating online and high street outlets. Better still, all valid NUS extra cardholders can download and unlock all the features within the TOTUM app. Come to your local SU Info Desk, fill out a form and we’ll print your card straight away. Treforest: Students' Union, middle floor. Cardiff: Atrium, adjacent to the Zen Bar. Newport: SU Hub, ground floor of City campus. 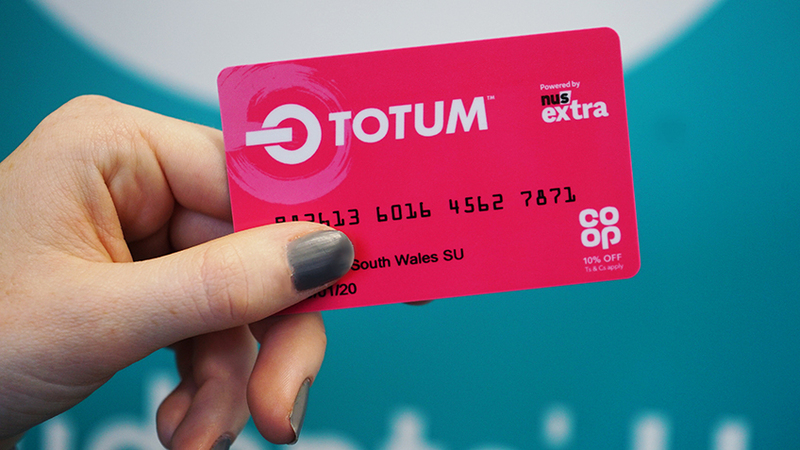 Go to the TOTUM website, fill out the form, select ‘Click & Collect’ and you can visit the SU immediately and we’ll print your card. Go to TOTUM, fill out the form, you can choose to have your card delivery to your address or to the address of the SU - whichever is better for you. Deliveries usually take 5-7 days.